Julian C. Chambliss, Ph.D. is professor of United States History at Rollins College. His research examines race, identity, and community in real and imagined spaces. 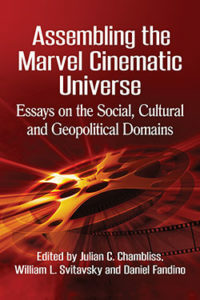 His academic articles on comics have appeared in Marvel Comics into Film, Ages of Iron Man, Critical Survey of Graphic Novels: Heroes and Superheroes and Studies in American Culture. He is co-editor and contributor to Ages of Heroes, Eras of Men: Superheroes in the American Experience (2013). William L. Svitavsky is an associate professor and Emerging Services Librarian at the Olin Library of Rollins College. His research includes American comic book history, the work of M.P. Shiel, and geek culture. He previously co-edited and contributed to the volume Ages of Heroes, Eras of Men: Superheroes and the American Experience. Daniel Fandino is a history PhD student at Michigan State University in East Lansing, Michigan. His academic interests include American and East Asian popular culture, video games, nationalism, and technology. His most recent work has examined dark tourism in Eve Online and the history of World of Warcraft.